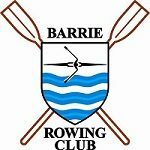 The Barrie Rowing Club was founded in the winter of 1987-88 by a small group of dedicated people who shared two things: a love of the sport of rowing, and a dream of establishing a permanent rowing club in Barrie. Amongst the Club’s first acquisitions were two old rowing shells borrowed from the Cornwall Rowing Club. The Club’s first boathouse was an old storage shed that the Club rented on Victoria Street. To put their boats on the water, rowers had to carry them along Victoria Street, across a set of railroad tracks, across Lakeshore Drive, through Centennial Park and across the beach. Without a dock, the rowers waded into the water to launch their boats. Despite these humble beginnings, the Club’s membership, equipment inventory and reputation grew. In 1990, the Club hosted a National Masters Sculling Camp. The Club’s reputation was further enhanced when in 1992, the Canadian Rowing Association held its annual National Coaching Conference in Barrie. By 1992, the Club’s expanding membership had outgrown the old boathouse. In 1993, the Rowing Club entered an ambitious partnership with the City of Barrie and several other local organizations (including the Barrie Canoe and Kayak Club and local Rotary Clubs). With funding from the City, the Province and each of the Community partners, an old CN maintenance building on the south shore was restored, expanded and transformed into the 1.5 million dollar Southshore Community Center. Barrie Rowing Club members have entered and won many races throughout Ontario. Several members have competed on provincial and national rowing teams.